Hours: Check our website for activities and times. 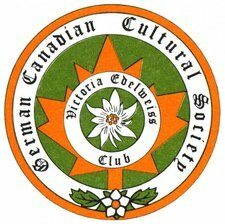 The German Canadian Cultural Society of Victoria (aka Victoria Edelweiss Club) is located at 108 Niagara Street in beautiful Victoria BC. Our hall can seat up to 300; and is the largest spring loaded dance floor (hardwood) in Victoria. We have a stage, bar facilities, audio and video equipment available. In addition to our main hall, we have four other rooms available for use or for rent - capacity ranging from 12 to 400. We also are very proud of our German library - books, magazines, music - and an active "literature circle" program. We are proud of our vibrant musical groups - the Victoria Accordion Club); the Victoria Edelweiss Harmony Choir and the Edelweiss Oktoberfest Dancers. Join us for Oktoberfest for 3 nights in October, October 15 presenting the Victoria Accordion Club and October 28 and 29 featuring S-Bahn; Christmas Market (admission by donation) on November 26, 2016, Choir concerts at least 2 times per year; monthly German films and a multitude of other activities throughout the year. Visit us online at www.victoriaedelweiss.ca.